We install top-quality forced-air heating systems for home owners. Expert Diagnostics. Extend the life of your current furnace. We can install high-efficiency air conditioning for your home. Summer relief! WHY ARE SPRING A/C TUNE UPS IMPORTANT? We are blessed with a great climate here in Northern Colorado. However, the fact is, it can get brutally hot in the summer months and quite cold during the winter. You need to count on your HVAC system to perform not only during these times, but all year-round. 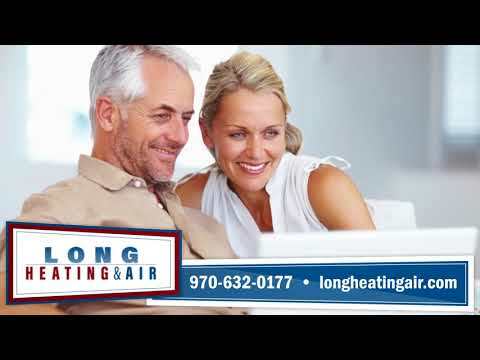 If you think your air conditioner is no long cooling the way it use to, or your furnace is noisy or behaving erratically, contact the friendly professionals at Long Heating & Air. We will find the problem and walk you through all your options to get you and your home comfortable again. Twenty-five years of industry experience has made our trusted, family run business Northern Colorado’s clear choice for all your HVAC needs. We are one of the Best-Rated local HVAC contractors in Northern Colorado.